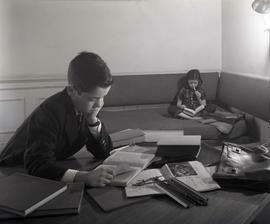 Black and white photograph of Roger and Jennifer Schiffer, Fred Schiffer's children, doing school work. Black and white photograph of an unidentified family at home. Black and white portrait of Fernando Sir O. 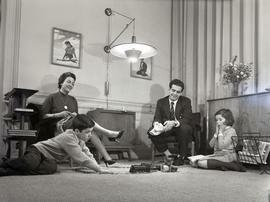 Black and white photograph of family members in a living room, titled "Fortoban". Note by Fred Schiffer on back of print says "see Architecture Digest of March 1989". Black and white portrait of Argentinian General and Minister of War Franklin Lucero. Black and white still life photograph for Licuadora, Graphic Studio. Black and white photograph of a family reading with their child. Photograph was titled "Houston" by Fred Schiffer. Black and white photograph of Jennifer Schiffer, Fred Schiffer's daughter, likely from August 1954.